SAN LUIS OBISPO, Calif. — (February 23, 2016) — Race SLO, the Central Coast’s endurance sporting event leader, has renewed its partnership with McMillan Running Company, Inc. for two 2016 events: the 5th San Luis Obispo Marathon, Half Marathon + 5K presented by LeftLaneSports.com (April 30 — May 1) and the inaugural SLO Ultra trail races (September 10). McMillan Running, based in Flagstaff, Ariz., is Race SLO’s Official Training Program and Training Club. For entrants, the partnership includes unique Training Programs for the SLO Marathon + Half Marathon and SLO Ultra courses through the McMillan Run Club. More information is available at: www.slomarathon.com/course-description-training. McMillan coaches Ian Torrance and Emily Harrison, both national class runners, will provide monthly training tips and share insights that will be posted on the event’s website Training Page and via the event’s social media. “Ian and I are excited to share our knowledge and experience to help Race SLO entrants reach their training goals and racing potential,” said Coach Harrison, a 2016 U.S. Olympic Marathon Trials qualifier. McMillan Running Company was founded by Greg McMillan as a comprehensive online resource for distance runners. 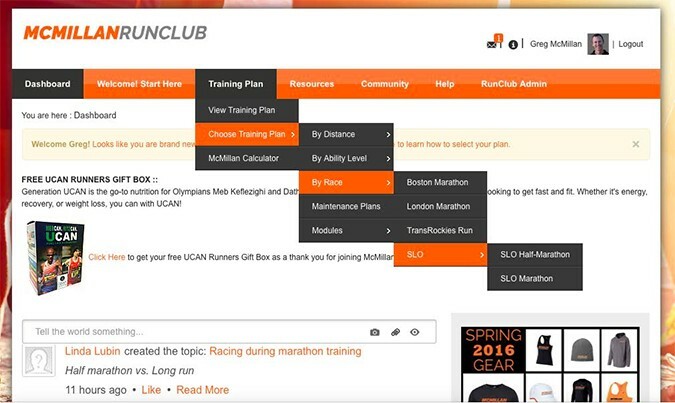 The company’s website and its companion, McRun App, provide a wealth of information for runners as well as training plans, personal coaching and other products and services. McMillan Running’s mission is simple: to help people fulfill their running potential, and to-date, hundreds of runners have received comprehensive training advice with proven results and success. Visit mcmillanrunning.com for more information. Established in 2010 to bring world class sporting events to the beautiful California Central Coast, the Race SLO family of annual events includes the 5th SLO Marathon + Half and Family Fitness 5K (Spring), SLO GranFondo cycling event (Fall) and the inaugural SLO Ultra trail races at Wild Cherry Canyon (Fall).